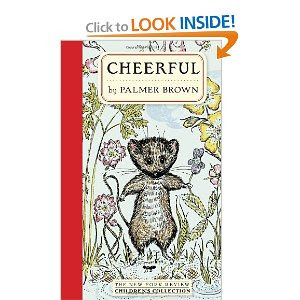 I had no idea who Palmer Brown was when I was recently approached about reviewing some of his titles, which are being re-released by The New York Review Children's Collection. Palmer Brown (1919–2012) was born in Chicago and attended Swarthmore and the University of Pennsylvania. 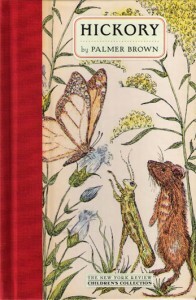 He was the author and illustrator of five books for children: Something for Christmas; Beyond the Pawpaw Trees, and its sequel, The Silver Nutmeg; Cheerful; and Hickory—all published by The New York Review Children’s Collection. I have to say that that amount of info does not exactly satisfy my curiosity. If you do an image search for the author's picture you get a variety of faces for options. Pick your person. I have no idea what he looks like. However, despite the fact that there is nothing much of interest about the man online, his books are thought important enough to republish. I was sent a copy of each of the titles being reprinted, two of which I'll be sharing with you today. When the package arrived with all of the titles, I was delighted to see that the majority involved mice as characters. Not that I like mice in real life, mind you, but we enjoy them in books. (Tumtum and Nutmeg anyone?) I let Bookworm1 select the first title for us to read and he chose Cheerful . (I mean, who wouldn't?) This is an Easter story about a little church mouse who lives in, um, the church, but who wishes he lived in the country. His siblings are all very satisfied in the city but Cheerful thinks of the stories his mother tells him about the place where she grew up. He longs to find the place where there were fields and woods and a blue stream. He wants to see this place for himself. One day Cheerful decides to leave the church and so he hops a ride on a fruit and vegetable cart that is passing by the church in hopes of finding his own outdoor paradise. Through a series of events he is packed away in an Easter Egg and shipped off to the country where he finds good reason to be plenty cheerful. This is a short, sweet story. It makes either a good 30 minute read-aloud (at most) or a great title to hand over to beginning readers. There are illustrations by Brown scattered liberally throughout the story, some in black and white and others in color. Both of my boys enjoyed this story and were happy to read for another Brown title immediately upon the close of this one. I let Bookworm2 select our second title for our read aloud time. He chose Something for Christmas which sounded like a pretty fine title to him! This book is much shorter, being your average picture book in length. 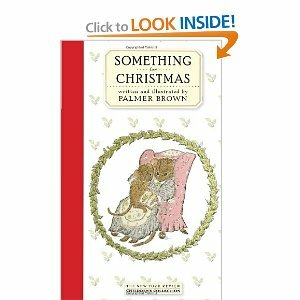 It tells the story of a young mouse who is fretting about what to give to his mother for Christmas. She notices that her child is struggling with something and asks what is the matter. "I'm wondering what to give someone for Christmas" is the reply. Through questions and conversations she assures the little mouse that the greatest thing that he could give to this special, unnamed someone is his love. That is all. Short. Sweet. To the point. This is a fun title to add to your Christmas library. What I especially love about this book are the illustrations which just have a classic feel to them. (This is probably why they were reprinted?) Everything about the book from the feel of the pages to the illustrations has a classic feel to it that makes it an added pleasure to read. I feel safe recommending the above two titles to you! I also feel very safe recommended Hickory which I read and reviewed over at 5 Minutes for Books. My review of that title posted last week if you are interested in checking that one out. We're reading through the last two titles we were sent at the moment and when we've finished, I'll be back to share our thoughts on those. Many thanks to The New York Review Books for sending these wonderful books my direction in exchange for my honest thoughts. My mouse-loving daughter would undoubtedly enjoy these. Wow. Incredible indeed! They LOOK sweet. Will be on the look out for them! These look like perfect books to add to my "vintage" children's shelf! I will be on the look out for Palmer Brown! His books look SO cute!